WBFed defence by Bejaran - off when Essaoudi pulled out due to injury. Gevor back after six years out and a gunshot in the knee. 59-57 twice Budera and 58-56 Engström after a close fight with Budera´s workrate against Engstöm´s fewer but harder punches. Sharifov took apart Nalikashvili in style. Nalikashvili was down late round two and again in the third before it was called off. After a slow first Jangirov floored Schrammel three times with bodyshots and it was stopped. Ubelava stormed out and bombed away and caught promoter Palacios with a big right, Palacios went down, got up but was counted out standing. Tollar floored three times in a big mismatch. 38-36 on all cards. Debut for Taha, who was floored 9 seconds into round one. Taha fought back and floored his opponent late in the fourth. Debut for Gustavsson, 40-36 on all cards. 98-91 and 95-94 Vorberger and 95-94 Radovanovic. WBC interim 118 lb title. Pulev ends this mismatch with a left hook. Dag to hospital afterwards for check up. 96-94, 98-92 twice. WBFed Int´l title. Wahlström retained the WBC title on scores of 97-93, 96-94 and 95-95 after a close fight. Lester was tiring, Räsänen attacked - and left himself open and was caught by a right, went down, got up but was under pressure and it was stopped - too soon according to some. Kekäläinen was floored in the third and seventh - and this was a tough loss for him. Takoucht won vacant IBF Int´l featherweight title on scores of 117-111 twice and 114-114. Laggoune retained the IBF I-C title on scores of 116-112 on all cards. 77-74 and 76-75 Churbanov and 76-75 Karaxha. 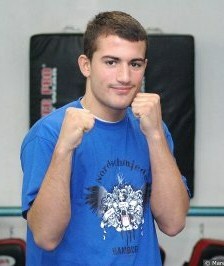 Mohammedi won the vacant WBA Continental title on scores of 119-109 twice and 118-110. Tachour won the French 140 lb title on scores of 97-93 and 98-92. Garrido won on one card 95-94. 78-73 and 77-75 El Moutaouakil and 76-75 Bola. Agmghar wore down Putkonen, who tired badly late in the fight.